A student-organized protest was held on Library Walk on Tuesday, Nov. 18, to contest the proposed tuition hike that eventually passed in the Committee on Long Range Planning at the University of California Regents’ meeting held the next day, Nov. 19. The full-voting members of the Board of Regents will vote later to finally reject or approve the plan. Over 300 students gathered in solidarity on Library Walk against the proposed tuition hikes, which would raise tuition by over 25 percent over the next five years. Photo by Cory Wong/Guardian. If the tuition increase plan passes, which was recommended by the UC Office of the President due to budget gaps in the UC system and a lack of funding from the state of California, it will institute an annual 5-percent increase that will occur over the next five years. 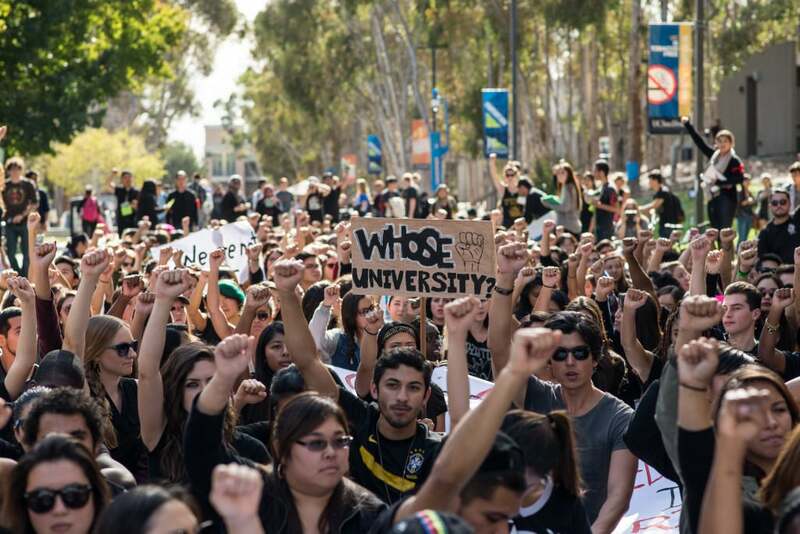 Approximately 300 students attended the protest and were encouraged to wear all black. A.S. Vice President of External Affairs Allyson Osorio explained that the number of people in attendance will demonstrate to the Board of Regents that a larger group of students than anticipated care about the tuition increase. In regards the two newly appointed Regents Eloy Ortiz Oakley and John A. Perez, Osorio said that she worked with Perez in her first year of college and he was proactive with the University of California Student Association. Graduate students and professors spoke at the event about their views regarding the potential increase and how the lack of opportunities that future students would have with the passage of the plan. They also discussed how the increase reflects a gradual privatization of the public university system. UCSD graduate student and literature Ph.D. candidate Niall Twohig explained that the protest is a common fight for access to a public education. Members from different student organizations including the Students of Affirmative Action Committee, Black Student Union and Movimiento Estudiantil Chicanola de Aztlan spoke on the matter and their disapproval on the proposed increase. Other A.S. Council members, including President Robby Boparai, Osorio, VP Campus Affairs Amber Hawthorne and VP Finance and Resources Igor Geyn, read a statement to the crowd that was written on behalf of UCSD students. That same statement was also sent to the Office of Financial Aid and UCSD Chancellor Pradeep Khosla. Boparai commented that the protest was the first time where members of Greek life, SAAC, athletes and A.S. Council members were all present for a common cause. An “open mic” was later held where students were allowed to share their feelings on the matter. Sixth College senior Francisco Javier Garcia explained how his expectations were exceeded by the amount of students in attendance, but how the proposed increase makes him fear for his little sister’s college education. Additional Reporting by Associate News Editor Tina Butoiu.